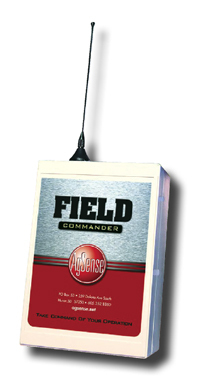 Field Commander is the next generation in Remote Field Management from AgSense. It is an advanced GPS driven pivot monitor/control system that communicates via the digital cell network to provide near real-time information and up to the minute alarms to your cell phone, smart phone or computer. 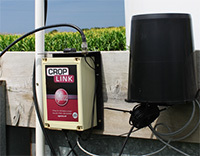 The CropLink is a multi-function device that can be connected to various tools in and around the irrigated field to monitor and control them through WagNet. The CropLink can communicate with the Field Commander mounted on a nearby pivot via radio connection to get the data to the customers WagNet page, where it can then be viewed along with the pivot information. Or, the CropLink can be equipped with a modem and connect directly to the internet and WagNet for applications where no Field Commander is available or radio communication is not a viable solution. Devices such as pumps, wells, flow meters, and soil moisture probes can all be monitored and/or controlled through CropLink. Additionally, real time charts and historical graphs can be generated by WagNet for simple and efficient record keeping. Easily implement irrigation decisions based on soil profile moisture content with the click of a button, from the comfort of your desktop computer or handheld device. Soil moisture content will display in simple, easy to read graphs on the WagNet page. 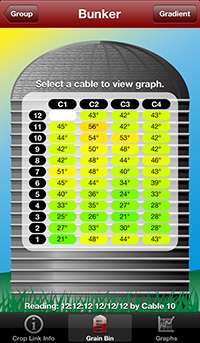 Grain TRAC reads most temperature cables on the market and sends the temperature readings to a secure web page. Remotely read thermocouple cables from any computer with internet access. Grain TRAC gives you the ability to monitor all your bins on a daily basis and receive user configurable alarms that identify the beginning of heat activity. Grain TRAC removes the guess work out of grain storage. Grain Trac eliminates the need for driving, climbing and keeping hand written notes. Grain TRAC gives you the ability to read current and past readings, generate reports, and view easy to read graphs. Grain TRAC user configurable alarms are sent to your cell phone to keep you connected, even when you are away from your computer. Weather TRAC enables you to sleep easier, save trips to the field, and use water more efficiently. Weather TRAC was designed for users that need real-time data to determine baling, irrigating, harvesting, and other conditions that require weather based decision making. Tank Trac provides you with real time fertilizer tank levels. 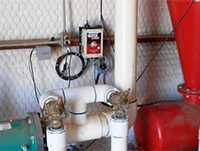 Receive instant alerts to prevent costly overflows or shortages. There is a high cost to over watering, including reduced yields and unnecessary energy expense. There is also a high cost to under-watering. But how much is too much? Making that question even more complicated is the fact that soil type, slope, and various other inputs all change the answer to the question. The right amount in one spot of your field may be very different from another spot in the same field. A very popular application for the AgSense Crop Link device is the monitor and control of irrigation pumps. Through the WagNet user page, the customer can view current status of the pumps and turn them on or off with the click of a button. This allows the user who is also monitoring and controlling the pivot with a Field Commander to remotely convert from “wet” to “dry” without having to make a trip to the field. The same Crop Link can also monitor flow meters and pressure, and record the history. This is a simple and efficient way to monitor and report water usage, particularly in districts that ration the amount of water the irrigator can pump during the season. The Crop Link can be easily programmed to send text message alerts to the customer notifying them of events such as high or low pressure, flow fluctuations, or loss of power. Irrigation system problems can be dealt with as they occur, rather than several hours or even days later.